Toyota Sienna owners say the power sliding doors have problems opening and closing. March 4, 2019 — A Toyota Sienna sliding door class action settlement has been proposed by plaintiffs and the automaker after minivan owners complained about doors that had problems when opening and closing. The proposed settlement includes all 2011-2018 Siennas, many that were recalled in 2016 because the motor circuits in the power sliding doors could cause blown fuses. Owners complained about sliding doors that opened while driving if the door latches were unlatched. Based on allegations in the lawsuit, the plaintiffs claim the front and rear latch circuits fail, the pulleys and cables in the power doors fail, the switches fail and the door hinges are defective. According to the proposed terms, Toyota will offer a "customer confidence program" to pay for repairs to the Sienna sliding door parts if they are related to the opening and closing operations of the power sliding doors in manual and power modes. The settlement, if approved by the judge, will also provide extended warranty coverage for parts related to the doors. The sliding door sub-assembly, center hinge assembly, fuel door pin and hinge will be covered for 10 years following the date of the final judgment order. For 2017-2018 minivans and certain 2016 Siennas to which current warranty enhancement program ZH4 does not apply, coverage for the sliding door front lock assembly will begin 10 years following the date of the final judgment order. For 2011-2015 Siennas and for certain 2016 models already covered by the ZH4 extended warranty, coverage will be extended to 10 years from the normal nine years offered by the ZH4 warranty. For 2016-2018 minivans and certain Siennas to which current warranty enhancement program ZH4 does not apply, coverage for the sliding door rear lock assembly will begin 10 years following the date of the final judgment order. For 2011-2014 Siennas and certain 2015 to which extended warranty ZH5 applies, the warranties will be extended to 10 years, one year more than the nine years offered by ZH5. For 2011-2016 minivans, the G04 recall remedy kit is subject to a one-year replacement part warranty that will be extended to two years. 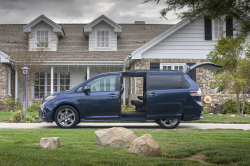 The proposed sliding door settlement will also provide a loaner vehicle for minivans undergoing repairs, and dealers will be expected to inspect any Sienna sliding doors a customer has concerns about. Each Sienna will be eligible for one inspection within one year of the final judgment of the lawsuit. Affected Sienna customers may also submit claims for previous out-of-pocket expenses to repair the power sliding doors. However, claim forms must be submitted with supporting documents to show those expenses. Lawyers for Sienna customers will receive $7 million for fees, costs and expenses. Sienna customers may learn more and find claim forms at ToyotaSiennaDoorSettlement.com. The Toyota Sienna sliding door class action lawsuit was filed in the U.S. District Court for the District of Connecticut - Simerlein, et al. v. Toyota Motor Corporation, et al. The plaintiffs are represented by Beasley, Allen, Crow, Methvin, Portis & Miles, P.C., DiCello Levitt, Wolf Haldenstein Adler Freeman & Herz.